The Jotul F118 CB Black Bear is a timeless classic which has been updated with clean-burn technology and new details. 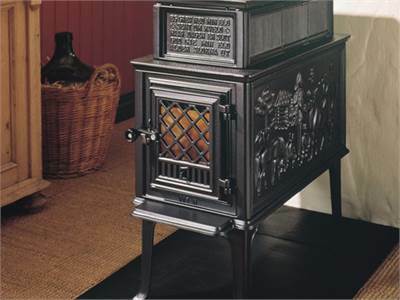 The front of the wood stove is decorated with an ancient Norwegian prayer that was believed to keep the fire lit and the dark forces away from the house. Dimensions(HXWXD); 30 1/2" X 14" X 31 1/2"
Minimum Hearth Dimensions(WXD): 30 1/2" X 53"